Exposure of phosphatidylserine (PS) on the outer leaflet of the plasma membrane is a key feature of apoptosis. As the signals underlying these phenomena are unknown, it is generally assumed that PS exposure is a consequence of caspase activation, another hallmark of apoptosis. In this study we investigated the role of caspases in PS externalization during apoptosis of activated PBL triggered by drugs (etoposide, staurosporine), CD95 engagement, or IL-2 withdrawal. Anti-CD95 mAb induces a rapid activation of caspases, followed by PS exposure and mitochondrial transmembrane potential (ΔΨm) disruption. In contrast, etoposide (ETO), staurosporine (STS), or IL-2 withdrawal triggers concomitant caspase activation, PS exposure, and ΔΨm disruption. Such kinetics suggest that PS exposure could be independent of caspase activation. As expected, in activated PBL treated by anti-CD95 mAb, the pan-caspase inhibitor Cbz-Val-Ala-Asp(OMe)-fluoromethylketone and the caspase-8 inhibitor Cbz-Leu-Glu-Thr-Asp(OMe)-fluoromethylketone, but not the caspase-9 inhibitor Cbz-Leu-Glu-His-Asp(OMe)-fluoromethylketone, inhibit PS externalization and ΔΨm disruption. Surprisingly, during apoptosis induced by ETO, STS, or IL-2 withdrawal, none of those caspase inhibitors prevents PS externalization or ΔΨm disruption, whereas they all inhibit DNA fragmentation as well as the morphological features of nuclear apoptosis. In Jurkat and H9 T cell lines, as opposed to activated PBL, PS exposure is inhibited by Cbz-Val-Ala-Asp(OMe)-fluoromethylketone during apoptosis induced by CD95 engagement, ETO, or STS. Thus, caspase-independent PS exposure occurs in primary T cells during apoptosis induced by stimuli that do not trigger death receptors. As important as cell division, programmed cell death or apoptosis allows the shaping of the organism during development and tightly controls cell number and tissue homeostasis in adult life (1). Engulfment of dying cells by macrophages or neighboring cells represents the denouement of the apoptotic program for most cells in multicellular organisms (2, 3). Phagocytosis of apoptotic cells from tissues prevents their lysis and the consequent release of toxic or immunogenic intracellular components. By inducing the release of mediators such as TGF-β, IL-10, and PGE2, clearance of apoptotic cells also sets up an anti-inflammatory milieu within the tissue (4). Many receptors, including C1q and lectin receptors (5), scavenger receptors such as CD68 (6) or CD36 associated with αvβ3 or αvβ5 vitronectin receptors (7, 8), CD14 (9, 10), and the recently cloned phosphatidylserine (PS)4 receptor (11) have been reported to mediate the binding and uptake of apoptotic cells by macrophages. The most characteristic surface change on apoptotic cells is the loss of phospholipid bilayer asymmetry and the exposure of oxidized PS on the outer leaflet of the plasma membrane (12, 13, 14, 15, 16), the latter change being absolutely required for recognition and engulfment to occur (2, 16). Although the PS receptor specifically recognizes PS exposed on the surface of apoptotic cells, the milk fat globule-EGF-factor 8, a secreted glycoprotein produced by activated macrophages, may also bind to PS, facilitating recognition by αvβ3 expressed on phagocytes (17). While PS is actively transported from the outer to the inner leaflet of the plasma membrane by ATP-dependent aminophospholipid translocase (12, 18), the implication of a scramblase that moves phospholipids bidirectionally across the membrane is still debated (19). Proteolytic activity plays an important role in apoptosis, and caspases appear to be essential for the execution of apoptotic process (20). Caspases are cysteine proteases, highly conserved through evolution, that have an absolute specificity for an aspartic acid in the P1 position of the substrate and cleave important cellular substrates responsible for characteristic features of apoptosis (21). Among these substrates, protein kinase Cδ, which phosphorylates scramblase 1 during apoptosis (22), is cleaved by caspase-3, suggesting a plausible mechanism by which this kinase, and subsequently the scramblase, can become activated in a sustainable manner. Moreover the pan-caspase inhibitor Cbz-Val-Ala-Asp(OMe)-fluoromethylketone (zVAD) has been shown to inhibit PS exposure in cell lines undergoing apoptosis (23, 24), suggesting that PS externalization is a caspase-dependent feature of apoptosis. Meanwhile, caspase-independent PS exposure and specific phagocytic clearance have been reported in aged platelets (25). Despite their critical importance to recognition and engulfment of apoptotic cells, the mechanisms mediating externalization of PS are still not well defined. In particular, the role of caspases in this phenomenon is still debated. In the present study we investigated the implication of caspases in PS exposure and mitochondrial transmembrane potential (ΔΨm) disruption in primary T cells undergoing apoptosis by physiological stimuli either by IL-2 withdrawal, which mimics death by neglect when Ag has been cleared from the organism, or by a more active form involving death receptors, such as CD95 (26). We also used drugs (etoposide and staurosporine) that are known to trigger mitochondrial-dependent apoptosis in activated PBL (27, 28). In contrast to T cell lines, PS exposure in primary T cells undergoing apoptosis by staurosporine (STS), etoposide (ETO), or IL-2 withdrawal is caspase independent. Our results further point to an intimate association between PS exposure and ΔΨm disruption, suggesting that mitochondria could control PS exposure. PHA, Hoechst 33342, STS, and ETO were purchased from Sigma-Aldrich (St. Quentin Fallavier, France). Recombinant human IL-2 was obtained from Chiron-France (Suresnes, France). The broad spectrum caspase inhibitor benzylloxycarbonyl zVAD was purchased from Bachem (Voisins-Le-Bretonneux, France). The caspase-8 Cbz-Ile-Glu-Thr-Asp(OMe)-fluoromethylketone (zIETD) and the caspase-9 Cbz-Leu-Glu-His-Asp(OMe)-fluoromethylketone (zLEHD) inhibitors were obtained from Calbiochem (Meudon, France). The agonistic anti-CD95 Ab (7C11, IgM) was purchased from Immunotech (Marseilles, France). PBL were collected from healthy donors in the presence of sodium citrate. Blood was defibrinated, then mononuclear cells were isolated by centrifugation on a layer of Histopaque (Dutcher, Brumath, France). Those suspensions contained 74.4 ± 2.0% T lymphocytes, 7.5 ± 1.2% B lymphocytes, 16.1 ± 1.9% NK cells, and 0.8 ± 0.4% monocytes as defined by the expression of CD3, CD20, CD56, and CD14, respectively. PBL were resuspended in RPMI 1640 (Sigma-Aldrich) supplemented with 10% FCS, 2 mM l-glutamine, and antibiotics (penicillin, 100 U/ml; streptomycin, 100 μg/ml) and were cultivated in a humid atmosphere containing 5% CO2. Activated T lymphocytes were obtained by activation of PBL for 3 days with PHA (5 μg/ml). At this stage dead cells were removed, and viable cells (106/ml) were treated with the different apoptotic stimuli in the presence or the absence of caspase inhibitors. After 3 days of stimulation with PHA, cells were further incubated for 7 days with IL-2 (50 U/ml). In these conditions, T lymphoblasts were susceptible to apoptosis induced by IL-2 withdrawal (29). The human T leukemia cell lines Jurkat and H9 were obtained from American Tissue Culture Collection (Manassas, VA) and provided by Dr. K.-M. Debatin (University Children’s Hospital, Ulm, Germany). Both cell lines were maintained in RPMI 1640 (Sigma-Aldrich) supplemented with 10% FCS, 2 mM l-glutamine, and antibiotics (penicillin, 100 U/ml; streptomycin, 100 μg/ml) and were cultivated in a humid atmosphere containing 5% CO2. PS exposure was quantified by surface binding of annexin V (14). Cells (2 × 105) were resuspended in annexin V binding buffer containing FITC-conjugated annexin V for 15 min following the instructions of the manufacturer (Bender MedSystems, Vienna, Austria). Propidium iodide (PI; 1 μg/ml) was then added, and cell suspension was immediately analyzed by flow cytometry using a FACSCalibur and CellQuest software (BD Biosciences, Pont de Claix, France). Analysis of ΔΨm was determined by incubating cells at 37°C for 15 min with 40 nM of the cationic lipophilic fluorochrome 3,3′-dihexylocarbocyanine iodide (DiOC6; Molecular Probes, Eugene, OR) (30), followed by immediate analysis by flow cytometry. Single-stranded DNA fragmentation was detected using F7-26 mAb from Alexis Corp. (Apostain; Laufelfingen, Switzerland), according to the manufacturer’s instructions. Percentages of cells with active caspases were estimated by flow cytometry staining with an in situ marker FITC-VAD-fluoromethylketone (CaspACE) from Promega (Charbonnieres, France) according to the manufacturer’s protocol. Treated cells were washed with PBS, and pellets were resuspended in lysis buffer (10 mM Tris-HCl (pH 7.6), 150 mM NaCl, 1% Triton X-100, 10 mM EDTA, and the protease inhibitor mixture). Thirty micrograms of proteins were separated on SDS-PAGE and transferred to nitrocellulose membrane (Schleicher and Schuell, Dassel, Germany). Blots were blocked for 2 h at room temperature in PBS/0.1% Tween containing 5% nonfat dried milk and incubated overnight at 4°C with anti-caspase-8 (provided by P. Krammer), anti-caspase-3 (BD PharMingen, San Diego, CA), or anti-actin Abs (Sigma-Aldrich). Detection was achieved with the appropriate secondary Abs coupled to HRP (Amersham, Les Ulis, France), followed by ECL Western blotting (Amersham), and autoradiography was performed. As a first approach to assess the role of caspases in PS externalization, the kinetics of caspase activation were compared with those of ΔΨm disruption and PS externalization in activated PBL treated with anti-CD95 mAb, STS, or ETO or after withdrawal of IL-2. Caspase activation was first studied by flow cytometry analysis using the broad spectrum substrate FITC-VAD-fmk. Anti-CD95 mAb induces a rapid activation of caspases, detected in 22% of the cells by 3 h and reaching a maximum at 12 h, at which time 36% of the cells exhibited activation of caspases (Fig. 1⇓A). STS and ETO induce a later activation of caspases, since STS-treated cells exhibited only 15% of cells with active caspases after 3 h, and ETO-treated cells needed >6 h to exhibit active caspases (Fig. 1⇓A). Kinetics analysis of caspase activation, ΔΨm disruption, and PS exposure associated with PBL apoptosis triggered by different stimuli. A, PBL were activated for 3 days in the presence of PHA and then treated with STS (0.5 μM), ETO (1 μM), or anti-CD95 mAb (0.5 μg/ml). At the indicated time, the percentage of cells with activated caspases was determined using FITC-VAD-fmk (CaspACE) as described in Materials and Methods. B, PBL were treated as described in A before the percentage of cells with decreased ΔΨm was determined using the DiOC6 fluorescent dye. C, PBL were treated as described in A, and then at indicated time the percentage of cells exposed to PS was measured by annexin V-FITC. D, PBL were activated for 3 days with PHA and then incubated for 7 days in the presence of IL-2. Under these conditions IL-2 withdrawal induced apoptosis, which was analyzed at the indicated time by three different parameters: percentage of DiOC6low cells, percentage of annexin V-positive cells, and percentage of CaspACE-positive cells. The results are the mean ± SD of an experiment performed in triplicate that is representative of three different experiments. To assess the precise kinetics of caspase activation in CD95-, STS-, and ETO-induced apoptosis, caspase-3 and -8 from PBL were analyzed by Western blotting. As expected, caspase-8, an initiator caspase, was processed into an 18-kDa active subunit as early as 30 min after CD95 mAb treatment, whereas 3 and 6 h were required for STS and ETO, respectively (Fig. 2⇓). The p17 active subunit of the effector caspase-3 was detected as early as 1 h of treatment with CD95 mAb vs 3–6 h with STS and ETO, respectively (Fig. 2⇓). 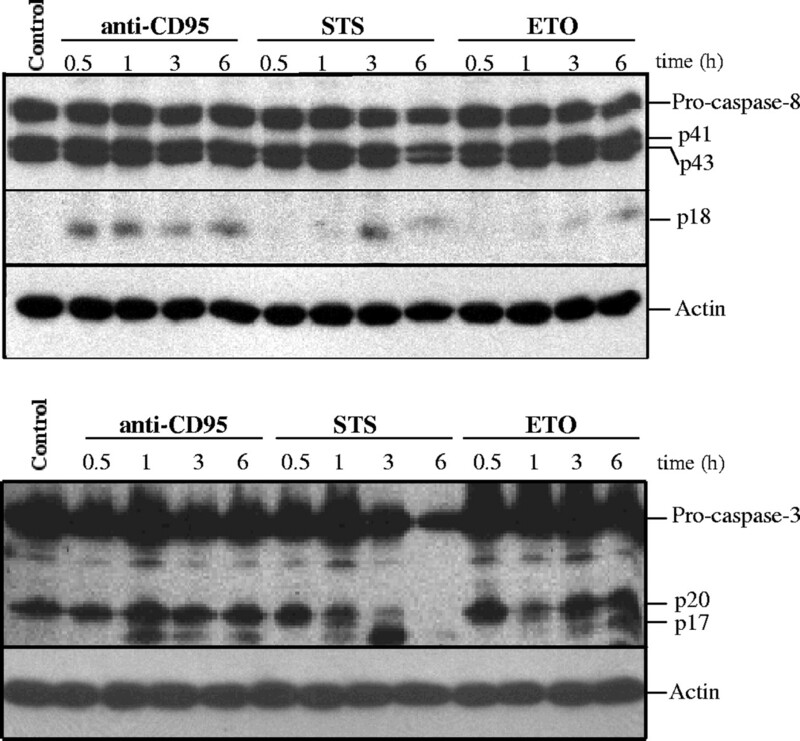 These results suggest that in PBL, activation of caspase-8 precedes that of caspase-3 in CD95-treated cells, whereas the opposite occurs in STS- and ETO-treated cells. Kinetics of caspase-8 and caspase-3 activation during CD95-, STS-, and ETO-induced apoptosis in primary T cells. Three-day-activated PBL were treated with anti-CD95 mAb (0.5 μg/ml), STS (0, 5 μM), or ETO (1 μM) for the indicated time. After washing with PBS, cells were lysed as described in Materials and Methods. A total of 30 μg of proteins was loaded and separated on 15% SDS-PAGE, followed by Western blotting with the anti-caspase-8 mAb (upper panel) and anti-caspase-3 mAb (lower panel). The amounts of loaded proteins were controlled for homogeneity by probing membranes with an anti-β-actin mAb. Results are from a typical experiment of two performed that showed similar results. The kinetics of ΔΨm disruption and PS externalization were also studied by cytofluorometric analysis using DiOC6 and annexin V-FITC, respectively. Anti-CD95 mAb and STS induce PS externalization and ΔΨm disruption starting as early as 3 h and reaching a plateau after 12 h, whereas 6 h were required after treatment with ETO (Fig. 1⇑, B and C). In T cell blasts apoptosis induced by IL-2 withdrawal, caspase activation, PS exposure, and ΔΨm disruption showed the same kinetics (Fig. 1⇑D). Together these results suggest that in PBL caspase activation precedes PS externalization and ΔΨm disruption in CD95-induced apoptosis, whereas concomitant caspase activation, PS exposure, and ΔΨm disruption were detected after STS-, ETO-, or IL-2 withdrawal-induced apoptosis. Such kinetics suggest that in PBL, PS exposure could be independent of caspase activation after STS-, ETO-, or IL-2 withdrawal-induced apoptosis. To investigate whether caspases are required for PS externalization in PBL undergoing apoptosis, we investigated the effect of caspase inhibitors on PS exposure and ΔΨm disruption. As expected, in activated PBL treated by anti-CD95 mAb, the pan-caspase inhibitor zVAD and the caspase-8 inhibitor zIETD inhibited PS externalization and ΔΨm disruption, whereas the caspase-9 inhibitor zLEHD demonstrated only partial inhibition (Fig. 3⇓, A and B). 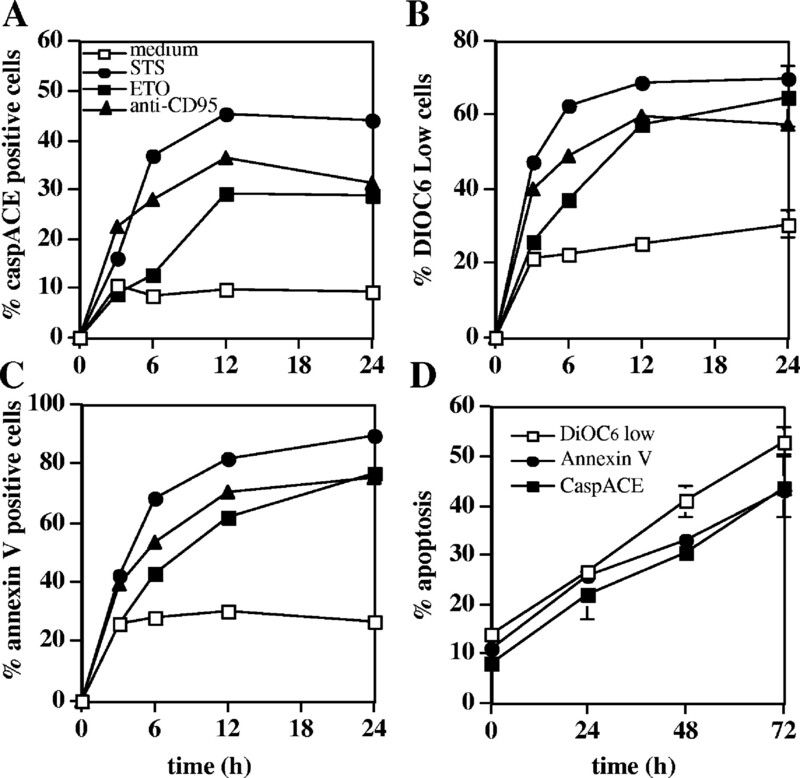 Surprisingly, in cells undergoing apoptosis induced by STS or ETO none of those caspase inhibitors decreased the percentage of annexin V-positive cells nor that of low DiOC6 cells (Fig. 3⇓, A and B), suggesting that with these agents PS exposure and ΔΨm disruption were caspase independent. These observations were confirmed in cells undergoing apoptosis after IL-2 withdrawal. In those cells PS exposure and ΔΨm disruption were not inhibited by addition of zVAD (Fig. 3⇓C). Effects of caspase inhibitors on PS exposure and ΔΨm disruption in primary T cells undergoing apoptosis by different stimuli. A, Three-day-activated PBL were incubated in the presence of caspase inhibitors (100 μM) for 1 h before treatment with STS (0.5 μM), ETO (1 μM), and anti-CD95 mAb (1 μg/ml) for 6 h. At this time cells were stained with annexin V-FITC and PI. The percentages of annexin V−/PI−, annexin V+/PI−, and annexin V+/PI+ are indicated on the upper right of each dot plot. B, Activated PBL were treated as described in A. After 6-h incubation, cells were stained with the fluorescent dye DiOC6. The percentage of cells with decreased ΔΨm is indicated for each histogram. C, The caspase inhibitor zVAD (100 μM) was added to 10-day-activated PBL for 1 h, and then cells were cultured with or without IL-2 for 48 h before staining with annexin V-FITC and PI (left panels) or DiOC6 fluorescent dye (right panels). Results are from a typical experiment of three performed that showed similar percentages. zVAD inhibits DNA fragmentation and morphological features of nuclear apoptosis. Since zVAD was unable to inhibit plasma membrane and mitochondrial loss of integrity in PBL undergoing apoptosis induced by STS, ETO, and IL-2 withdrawal, we investigated whether DNA fragmentation and morphological features of nuclear apoptosis were caspase dependent. zVAD inhibited DNA fragmentation whatever the apoptosis-inducing stimuli, whereas caspase-8 inhibitor only blocked anti-CD95 mAb-induced apoptosis (Fig. 4⇓, A and B). zLEHD decreased DNA fragmentation of PBL undergoing apoptosis induced by STS, ETO, and anti-CD95 mAb (Fig. 4⇓A), suggesting that caspase-9 may be required with other caspases to induce DNA fragmentation whatever the apoptosis-inducing stimuli. The pan-caspase inhibitor zVAD also inhibited nuclear condensation as well as nuclear fragmentation induced by STS, ETO, and anti-CD95 in PBL (Fig. 4⇓C), confirming the implication of caspases in modeling nuclear apoptosis. Effect of caspase inhibitors on DNA fragmentation in primary T cells undergoing apoptosis by different stimuli. A, Three-day activated PBL were treated as described in Fig. 3⇑, A and B. After 12 h incubation, DNA fragmentation was analyzed using the F7-26 mAb as described in Materials and Methods. The percentage of cells with fragmented DNA is indicated for each histogram. B, The caspase inhibitor zVAD (100 μM) was added to 10-day-activated PBL for 1 h and then cells were incubated with or without IL-2 for 48 h before DNA fragmentation was determined as described in A. C, Three-day-activated PBL were incubated with zVAD for 1 h before treatment with STS, ETO, or anti-CD95 mAb for 12 h. At this time cells were stained with Hoechst 33342 at 10 μg/ml and examined under fluorescent microscopy for nuclear morphology. Results are from a typical experiment of three performed that showed similar percentages. To determine whether the phenomenon of dissociation of PS exposure from caspase activation was cell type specific, we extended the study to the human T cell lines Jurkat and H9. These cells were treated with the same apoptosis-inducing stimuli, STS, ETO, or anti-CD95 mAb, in the presence or the absence of the pan-caspase inhibitor zVAD. In Jurkat and H9 T cell lines, zVAD inhibited PS exposure induced by anti-CD95 mAb, but, at variance from what is reported above for PBL, it prevented PS exposure induced by STS and ETO (Fig. 5⇓A). Similarly, zVAD inhibited ΔΨm disruption induced by anti-CD95 mAb as well as by STS and ETO (Fig. 5⇓B). Thus, the caspase-independent feature of PS exposure and ΔΨm disruption is cell type specific and restricted to PBL. Effects of caspase inhibitors on PS exposure and ΔΨm disruption in T cell lines undergoing apoptosis induced by different stimuli. Jurkat and H9 T cell lines were incubated for 1 h in the presence or the absence of zVAD (100 μM) and then treated with STS (1 μM), ETO (1 μM), and anti-CD95 mAb (50 ng/ml) for 12 h. At this time cells were stained with annexin V-FITC and PI (A) or with DiOC6 fluorescent dye (B) as described in Fig. 3⇑. Results are from a typical experiment of two performed that showed similar percentages. In this report we show that in PBL anti-CD95 mAb induces a rapid activation of caspase-8 and caspase-3, followed by PS exposure and ΔΨm disruption. Such kinetics are in agreement with the fact that proximal signaling from death receptors requires the formation of a death-inducing signaling complex, in which caspase-8 is rapidly processed into its active heterotetrameric form (31). These events occur upstream of the mitochondria and explain the powerful inhibition of both ΔΨm disruption and PS exposure by the pan-caspase inhibitor zVAD as well as the caspase-8 inhibitor zIETD. In contrast, the kinetics of caspase activation, PS exposure, and ΔΨm disruption in PBL undergoing apoptosis induced by STS, ETO, or IL-2 withdrawal do not rule out a possible caspase-independent regulation of PS exposure. This hypothesis was indeed confirmed by the demonstration that none of the caspase inhibitors tested was able to inhibit PS exposure and ΔΨm disruption, whereas zVAD and the caspase-9 inhibitor zLEHD completely or partially inhibited DNA fragmentation, respectively. These results suggest that in primary T cells undergoing apoptosis induced by stimuli that do not involve death receptors, PS exposure and ΔΨm disruption do not require caspase activation. In keeping with the present data, it was shown by Verhoven et al. (32) that PS exposure in D011.10 T cell hybridoma required caspase activation when apoptosis was triggered by CD95, but not when it was induced by glucocorticoids. In T cell lines we demonstrate here that zVAD blocks both PS exposure and ΔΨm disruption whatever the apoptosis-inducing stimulus, in agreement with previously published results (23, 24, 27). The discrepancy between primary T cells and T cell lines may reflect a difference in uncharacterized intracellular esterases, which are necessary to obtain the active form of caspase inhibitors. However, the ability of zVAD to inhibit both DNA fragmentation and morphological changes in nuclear apoptosis of PBL (Fig. 4⇑) rules out a general deficiency of esterases in PBL. This discrepancy may also be related to the fact that in T cell lines cytochrome c can be released from mitochondria even when ΔΨm is normal (27). Indeed, the loss in ΔΨm was only observed after activation of a succinyl-Asp-Glu-Val-Asp-specific caspase(s) (27). Moreover, the caspase inhibitor zVAD effectively blocked ΔΨm disruption induced by apoptosis-inducing agents in T cell lines (Fig. 5⇑), but failed to block the release of cytochrome c (27). This suggests that in contrast to primary T cells, ΔΨm disruption in T cell lines may be a consequence of caspase activity rather than the effector mechanism driving cytochrome c efflux. In primary T cells as well as in T cell lines, no dissociation between ΔΨm disruption and PS exposure could be detected in experiments using caspase inhibitors. It thus appears that these two apoptotic events are intimately associated and that one of them could be the consequence of the other. Indeed, one may hypothesize that PS exposure could be the consequence of an ATP depletion, consecutive to the ΔΨm disruption, that would inhibit the activity of the ATP-dependent aminophospholipid translocase. In accordance with this hypothesis, ΔΨm disruption precedes PS exposure in thymocytes both in vitro and in vivo after treatment with the glucocorticoid analog dexamethasone (33), and ΔΨm disruption is associated with a rapid cessation of ATP synthesis (34). Furthermore, oligomycin, an inhibitor of the F0-F1 ATPase, as well as inhibitors of the respiratory chain such as antimycin A are rapid inducers of PS exposure (33, 35). Further evidence for the role of ATP-dependent aminophospholipid translocase in PS exposure was recently obtained by experiments involving ATP depletion by 2-deoxyglucose or in glucose-free medium (36) Another hypothesis would involve the apoptosis-inducing factor (AIF) as a key protein in the regulation of PS exposure. Indeed, microinjection of AIF into the cytoplasm of intact cells induces PS exposure, and this effect is not prevented by zVAD (37), suggesting that AIF induces caspase-independent PS exposure. AIF would exert this function by activating the scramblase or by activating a caspase-independent protease (38) involved in the degradation of fodrin, a protein associated with the maintenance of membrane lipid asymmetry, by anchoring PS at the inner leaflet of the plasma membrane (39, 40, 41). In vivo caspase-independent cell death may occur in physiological situations. This is the case for cell death of aging platelets, in which PS exposure has been reported (25). In vivo PS exposure during caspase-independent cell death as well as during apoptosis would guarantee the rapid recognition and engulfment of the dying cell, which is important to prevent inflammation and major damage to the organism. In contrast, during necrosis cells were neither exposed to PS nor phagocytosed before their death (42). In the latter situation engulfment of necrotic cells strongly stimulates the DC to mature and activate T cells, whereas recognition and engulfmemt of pure apoptotic cell populations by DC are nonstimulatory (4, 43). Lastly, our results could have important consequences in attempts to manipulate apoptosis for therapeutic purposes. Indeed, in disorders characterized by excessive cell death, such as ischemia-reperfusion injury, neurodegenerative diseases, AIDS, or sepsis, preclinical studies with caspase inhibitors in animal models of human diseases have been reported (44). In most of these models caspase inhibitors decreased apoptosis and improved survival. However, caspase inhibitors may not completely prevent cell death, and their use carries the risk of transforming an apoptotic process into caspase-independent cell death, which may be potentially dangerous for the organism. Actually, our results demonstrate that, at least for primary T cells, PS exposure will not be affected by caspase inhibitors. The phagocytosis of dead cells will proceed normally and will prevent inflammation and damage to the organism. We thank Dr. P. Krammer for the caspase-8 Ab, Dr. K.-M. Debatin for the H9 cell line and Dr. G. Kroemer for stimulating discussions. ↵1 This work is supported by Institut National de la Santé et de la Recherche Médicale, a contract from Region Rhone Alpes (00816045), a fellowship from Institut National de la Santé et de la Recherche Médicale (to C.F.-P.), and a fellowship from the Ministere de l’Education Nationale et de la Recherche and from the Ligue Nationale contre la Cancer (to L.Q.). ↵2 C.F.-P. and L.Q. contributed equally to this work and therefore share the first authorship. ↵4 Abbreviations used in this paper: PS, phosphatidylserine; AIF, apoptosis-inducing factor; DiOC6, 3,3′-dihexylocarbocyanine iodide; ΔΨm, mitochondrial transmembrane potential; ETO, etoposide; PI, propidium iodide; STS, staurosporine; zIETD, Cbz-Ileu-Glu-Thr-Asp(OMe)-fluoromethylketone; zLEHD, Cbz-Leu-Glu-His-Asp(OMe)-fluoromethylketone; zVAD, Cbz-Val-Ala-Asp(OMe)-fluoromethylketone.